Takoyaki – “Octopus dumplings” are made by preparing a batter of flour blended with stock and pouring it onto a special iron plate with holes in it, adding chunks of octopus together with chopped onions and cabbage plus some pickled ginger, and finally baking them into balls by rolling them as they cook. The baked batter is crispy and spicy on the outside and soft inside, giving the dumplings a unique, crunchy texture and taste. The usual toppings are green laver, sauce or sliced and dried bonito, mayonnaise is also becoming popular. Octopus dumplings from the Kansai region are not only delicious but are also small and easy to eat, making this a popular dish throughout Japan. 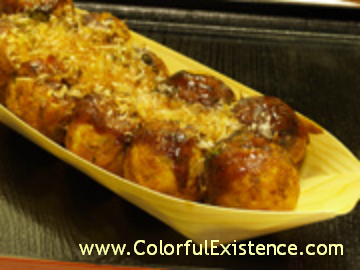 Do you happen to have Takoyaki or something similar from where you come from?? Forever in love with takoyaki! !